Kenai’s Allie Ostrander showed incredible durability, determination and downright guts on the final day of the NCAA Track & Field Championships in Eugene, Oregon. 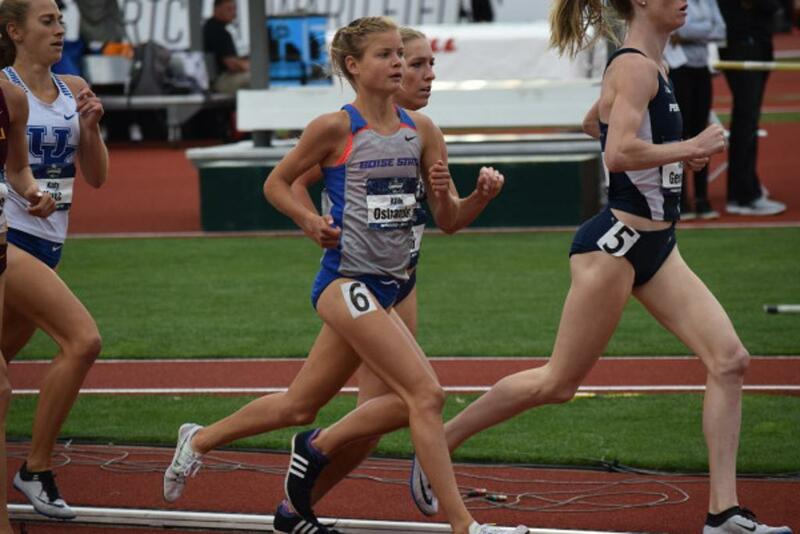 The Boise State University redshirt freshman ran to a pair of NCAA All-American finishes within an hour and a half, winning the 3,000-meter steeplechase and coming back to grind out a fourth-place finish in the 5,000. Her victory in the steeplechase will go down as one of the most dominating performances by an Alaskan on the national stage. Televised by ESPN, it was must-see TV. Ostrander won with a time of 9:41.31 – chopping nine seconds off her PR set in qualifying two days earlier and beating second-place finisher Madison Boreman of Colorado by five seconds. In the fall of 2015, Ostrander finished second at the NCAA Cross Country Championships. There would be no bridesmaid finish this time. “Yesterday I was watching the meet and I kept seeing people become national champions and I was just staring at the screen in awe, wondering and imagining what that felt like,” Ostrander told ESPN after the race. Ostrander, of Kenai High fame, is a newcomer to the steeplechase; although she’s reminded people that he did the hurdles in middle school. This was just her fourth race. Unlike qualifying when she sat back, she jumped out to the lead in the finals and stayed there during the duration of the race at historic Hayward Field. With two laps left, it came down to her and Elinor Purrier of New Hampshire. Purrier came into the meet armed with a 6-0 record in the steeplechase and a 4:29 mile time. She’s a closer. They ran shoulder-to-shoulder on the final lap. Purrier moved into the lead shortly after the bell lap, but Ostrander quickly answered and then started to pull away … and away, and away. Ostrander stretched her lead so far that at one point you couldn’t see any other runners on the TV. In the post-race interview with ESPN, she said asked how she’d prepare for the 5,000 in about an hour and a half. “Go for a little job; try to keep the adrenaline going. Give my parents a hug,” Ostrander said. In the 5,000, Missouri's Karissa Schweizer ran away with the title in 15:38.93 to cap a NCAA sweep for indoor and outdoor national titles. Ostrander – the Mountain West Conference 10,000 champion – displayed grit and the heart of champion by running with the lead pack virtually the whole way before understandably fading at the end and placing fourth in 15:46.18. It didn’t matter. Nobody was catching Schweizer on this day. Still, Ostrander hit the All-American daily double in epic fashion and showed the world why she is considered one of the true rising stars in running. Van Williams is a freelance writer in Anchorage and a correspondent for the Alaska School Activities Association.